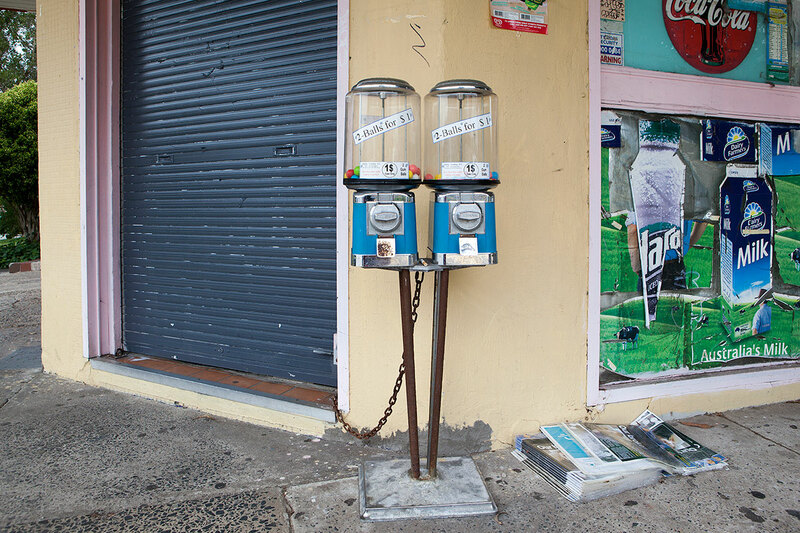 The Corner Store – Like stale bait on the end of a fishing line, the offer of ‘two balls for a dollar’ struggles to tempt our burning desire for a bargain. 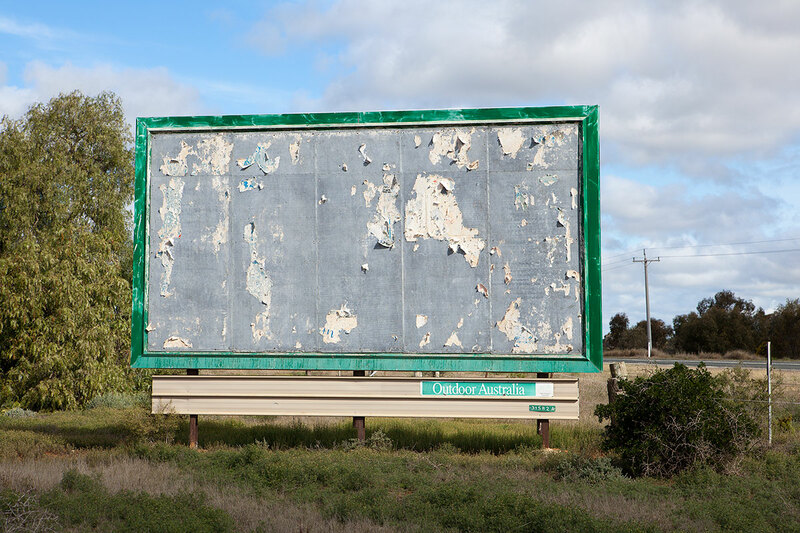 Outdoor Australia – Echoing our vacuous material lifestyle, this billboard, with its green coastal fringe and seemingly barren neglected centre, seems specific to Australia as a whole. 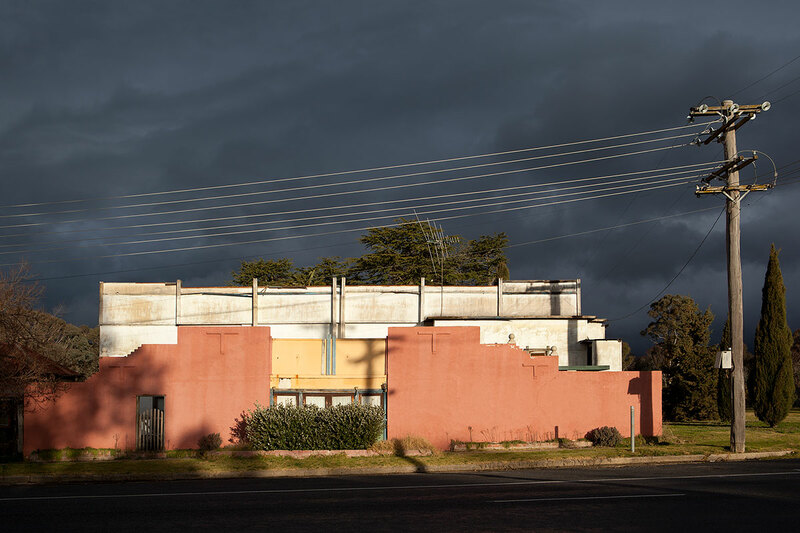 Mandurama Storm – As a fierce storm approaches, a last shaft of sunlight casts an ominous shadow on our relationship with nature. 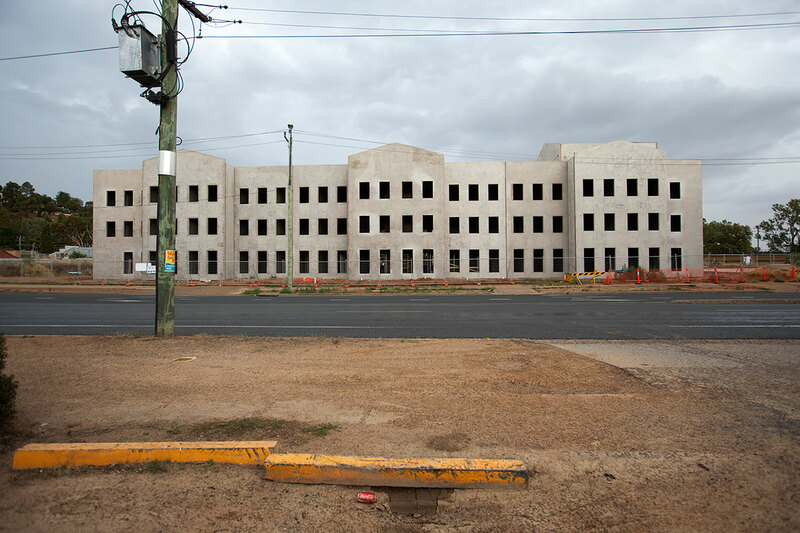 Cape Le Grande – An embryonic stage of construction. 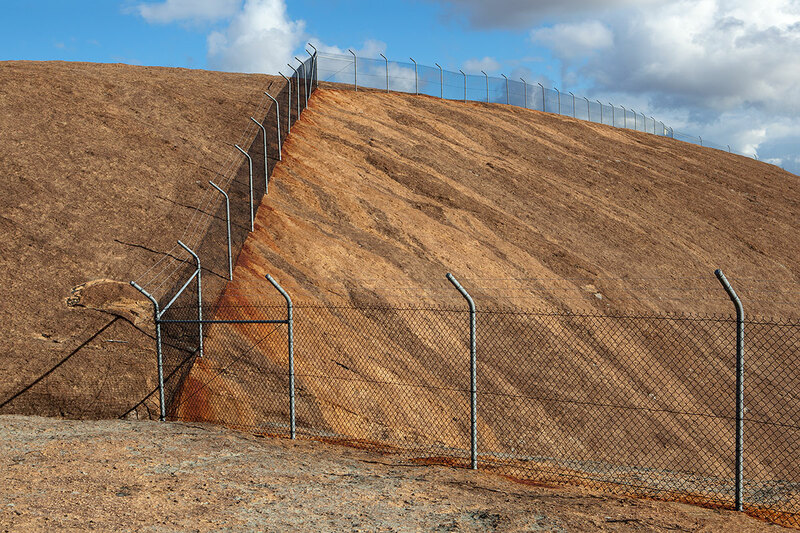 Beyond the Bowser – A peaceful hillside view filtered by man-made artefacts. 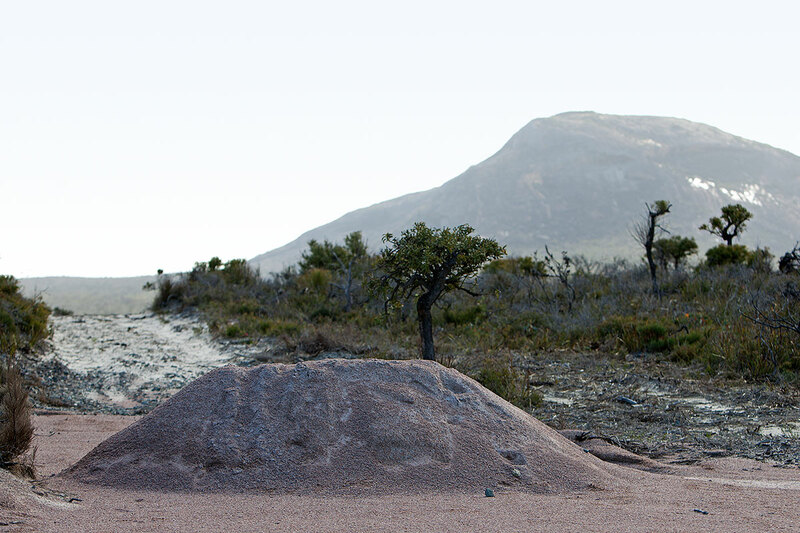 East Meets West – A winter frost burns an uncomfortable alliance between these visual manifestations of energy. 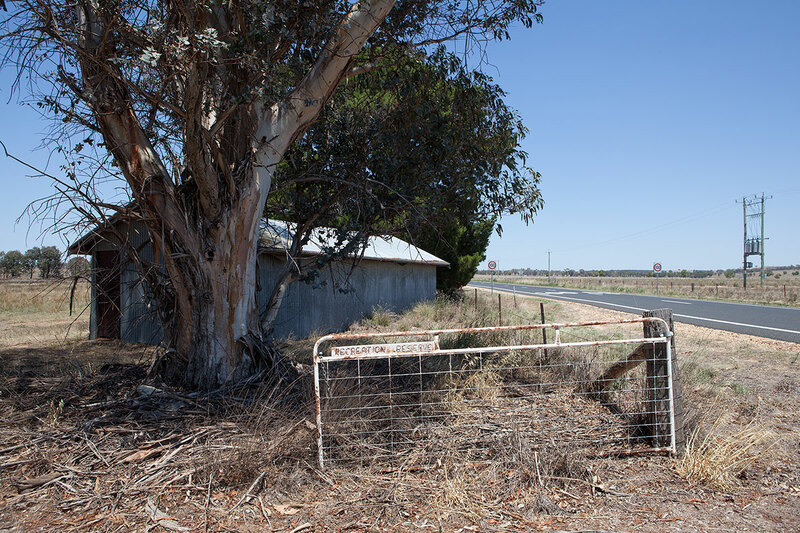 Firefly – Ignored by the sentinel-like precision placed bins, only the now scorched and shade-less tree bears witness to what occurs in the night. 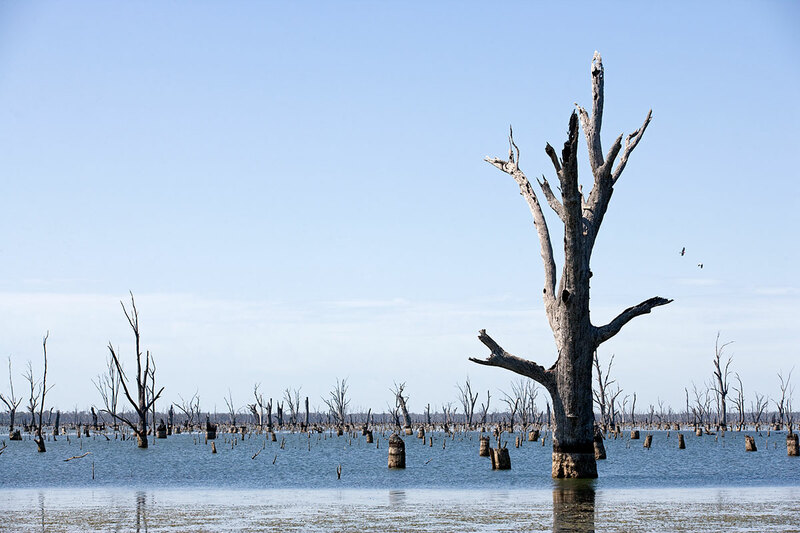 Lake Mulwala – The birds leaving this scene could be forgiven for never returning to this myriad of dead trees in a man-made lake. 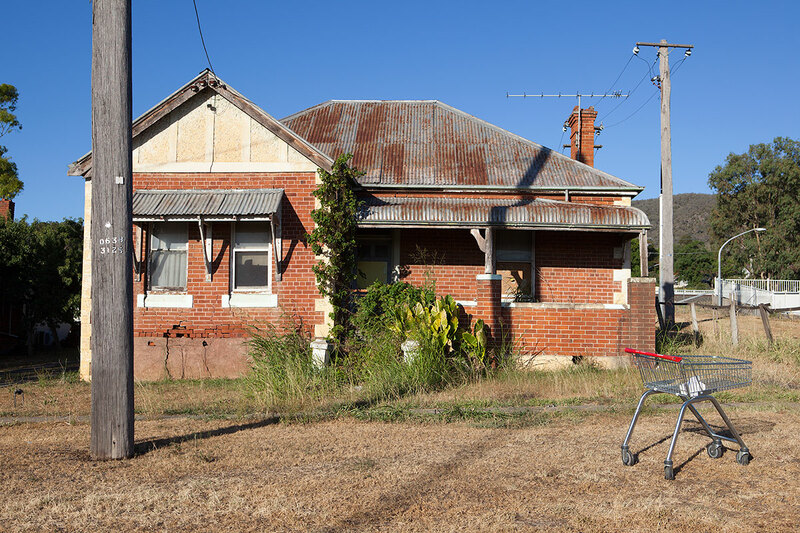 Tamworth Trolley – The humble shopping trolley, an enabler to shop till we drop. 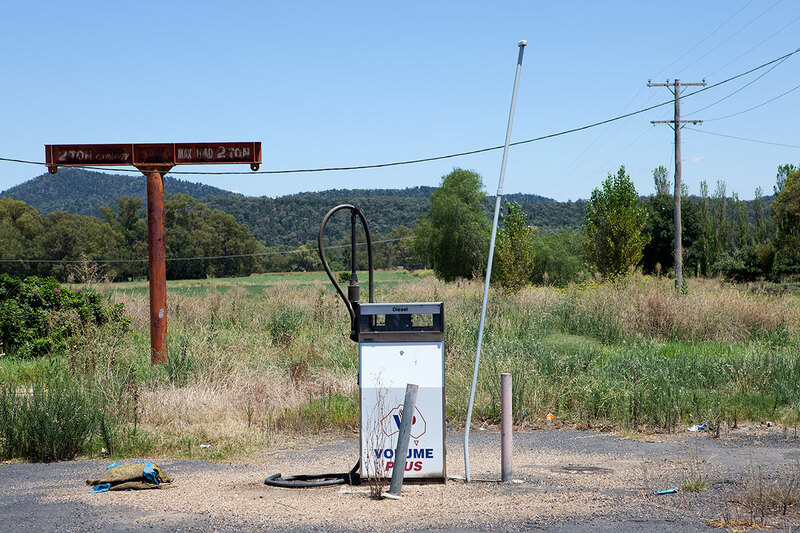 Caught in Limbo – Modern relics suspended in time, a common sight almost everywhere. 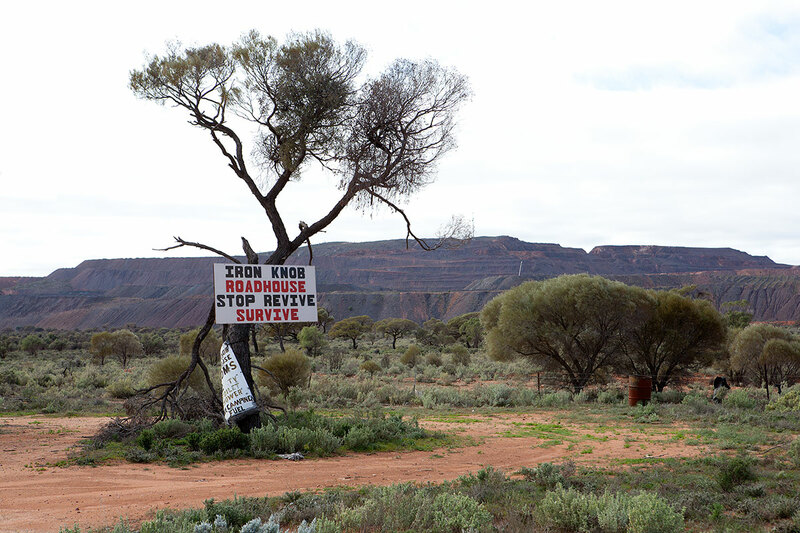 Morgans Lookout – White steps of steel conquer this once natural climb. 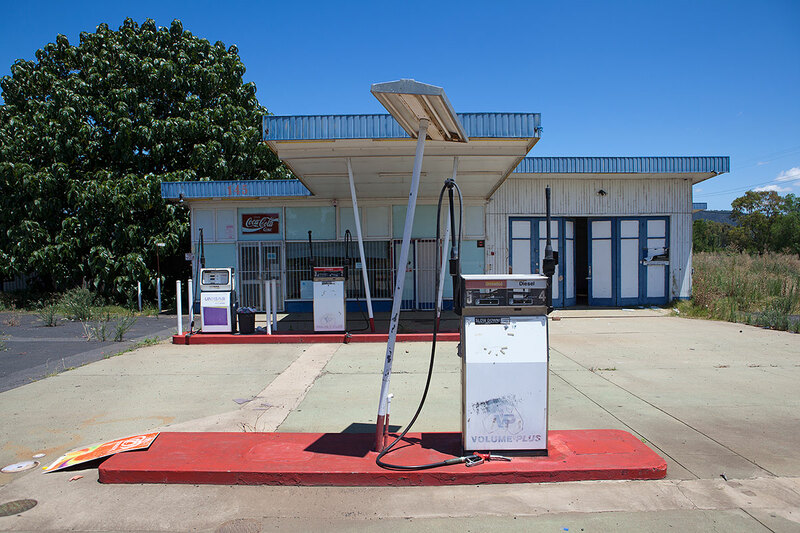 The Servo – Running on empty, defeat imminent. 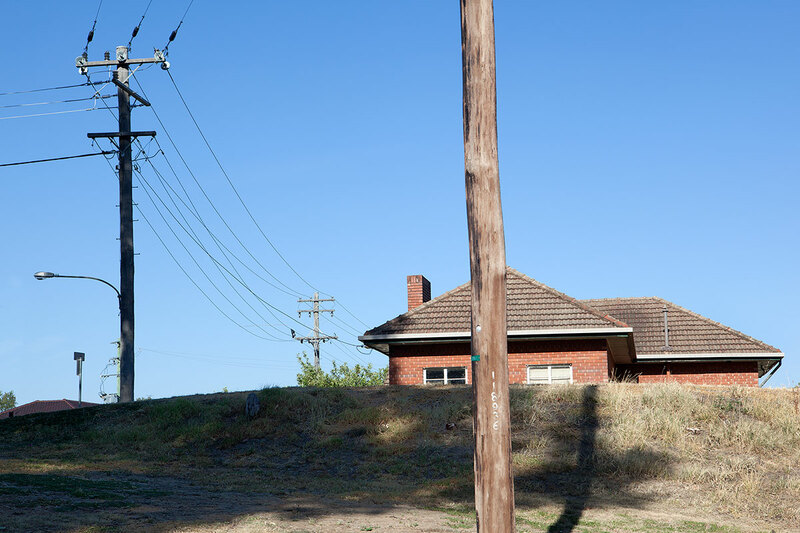 Bulgary Phone Exchange – The cost of staying barely connected. 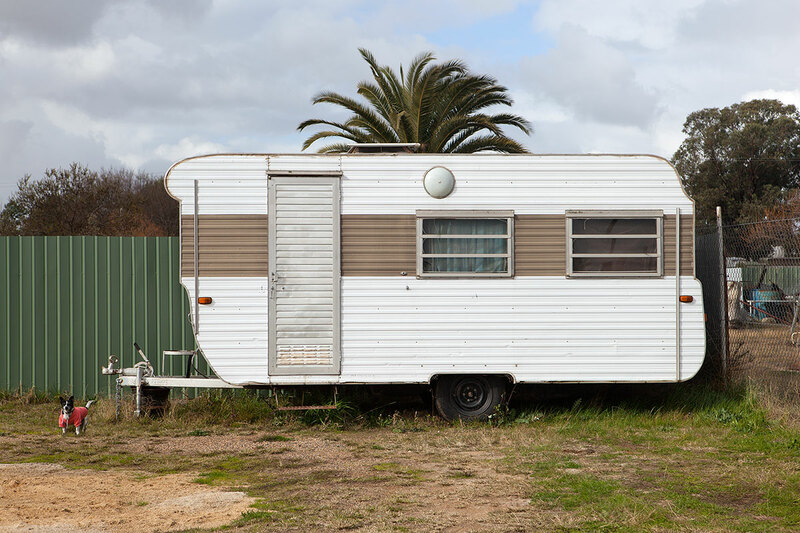 Life by the Levee – The modern struggle: keeping our heads above the mortgage. 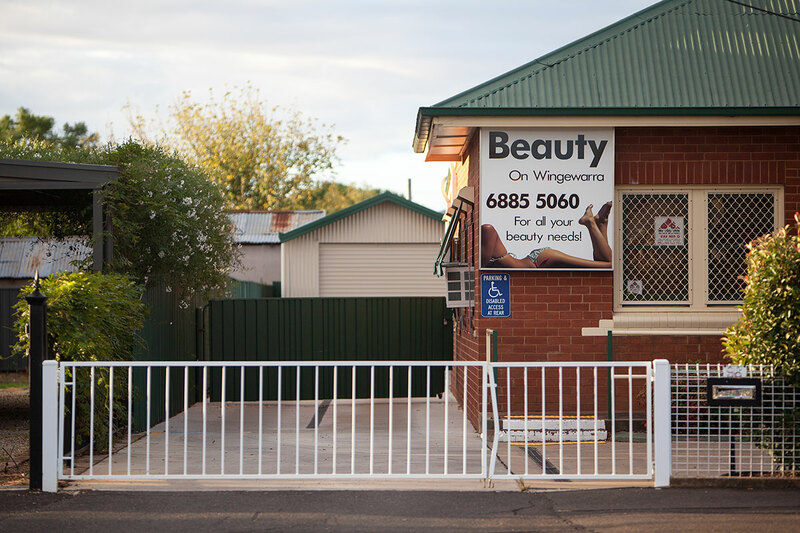 Beauty Clinic – Skin deep and headless. 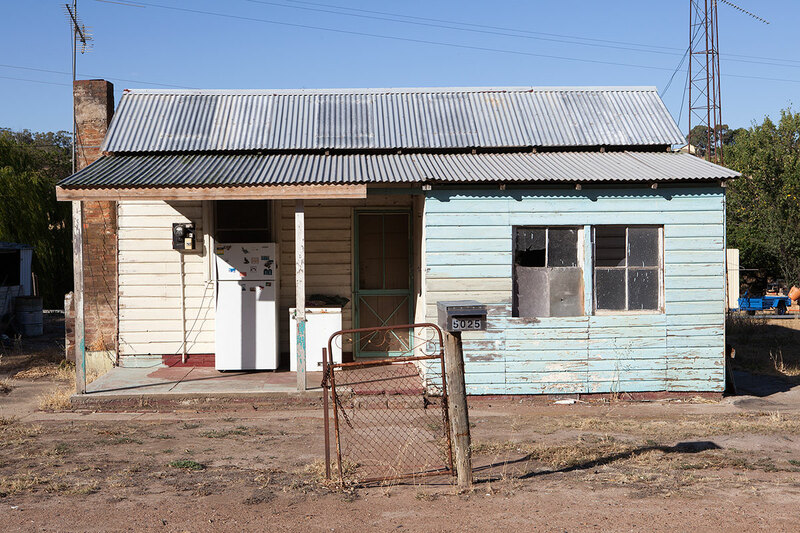 A Dogs Life – All dressed up and nowhere to go. 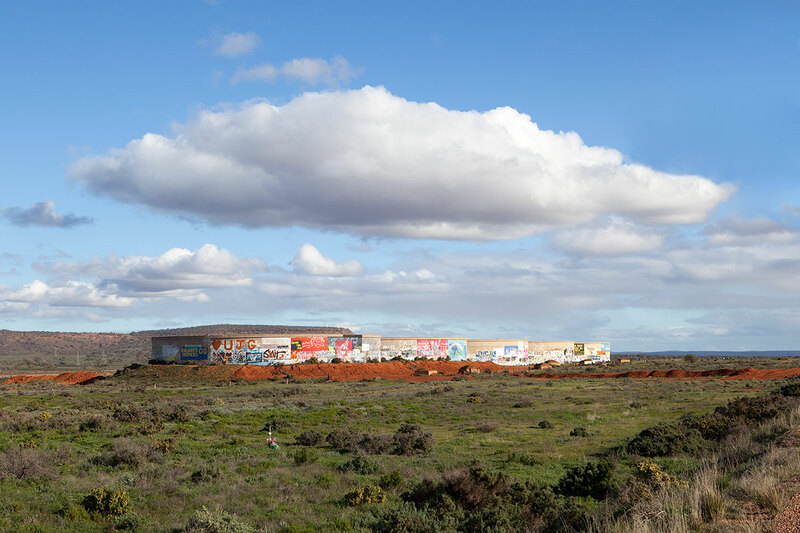 Estella Rise – The building blocks of suburban sprawl, like artists painting by numbers. 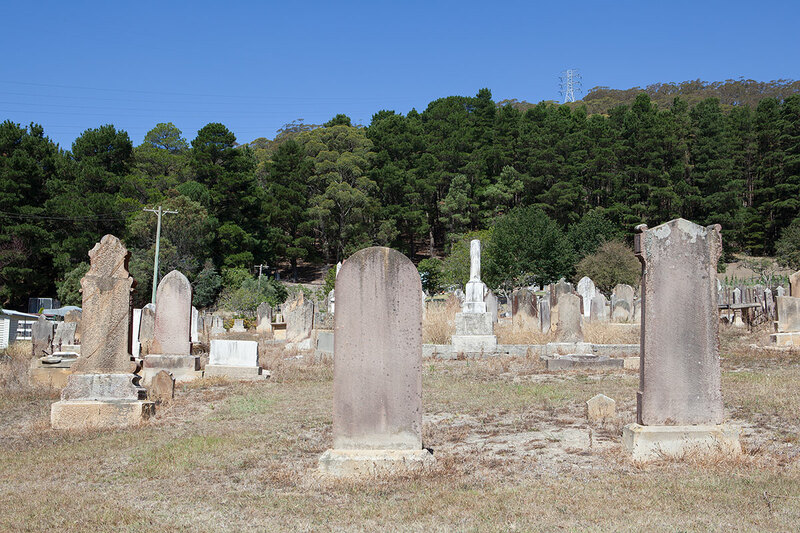 South Bowenfels Cemetery – The sky above offers ascension, but not without one last reminder of humankind’s seemingly immortal power that entwines the earth. 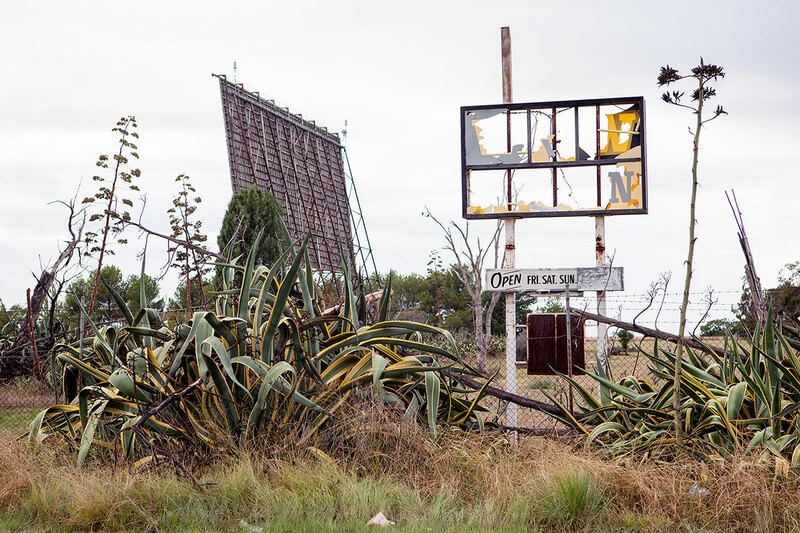 International Hotel – Strangely, before construction is even finished, this new hotel already casts a demeanour of decay rather than grandeur. 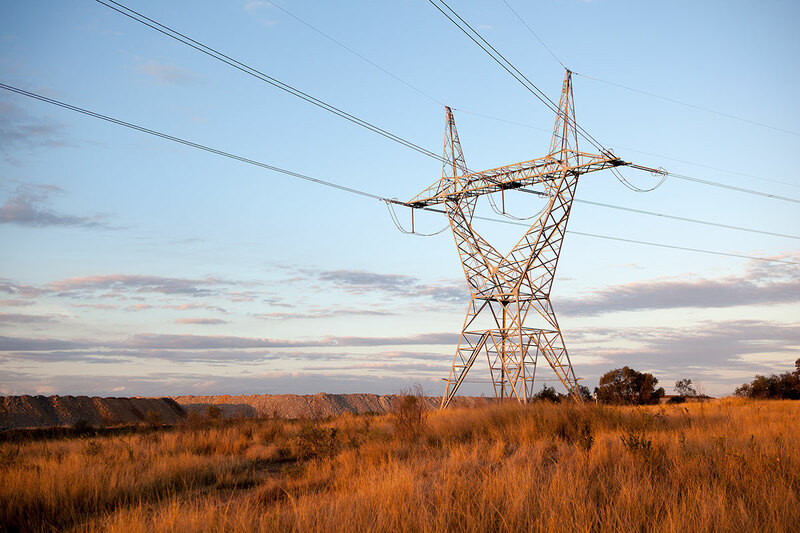 Warkworth Coal Mine – This modern God personified stands within a man-made landscape of mining tailings, an increasingly common sight across regional Australia. 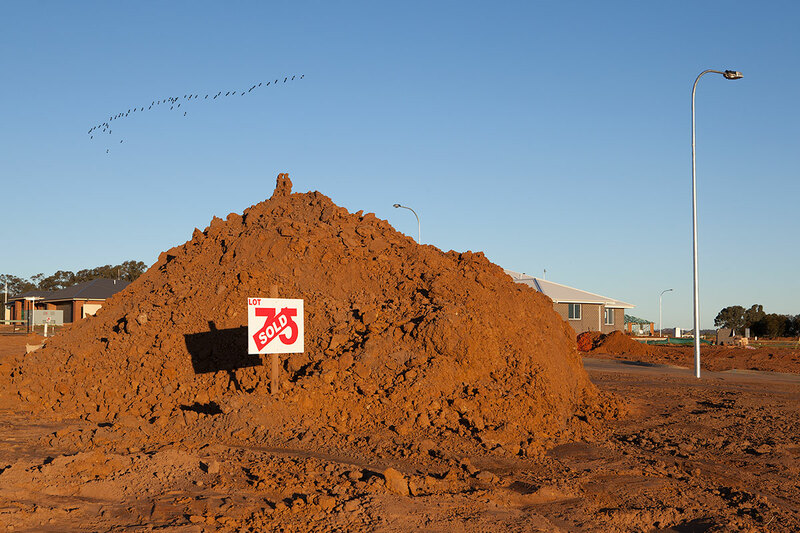 Capital Growth – Growth at head office flourishes as a take-over bid looms from behind. 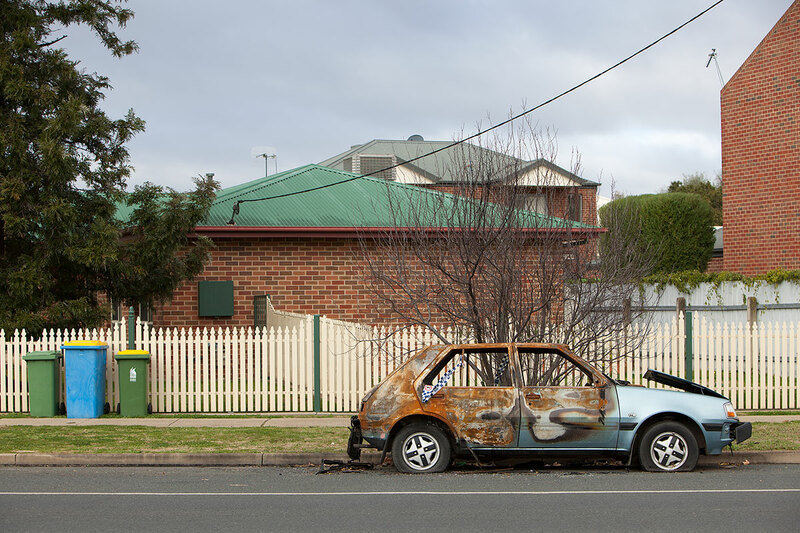 The Joyride – Abandoned and broken, the car soon becomes an integral component of a new landscape aesthetic. 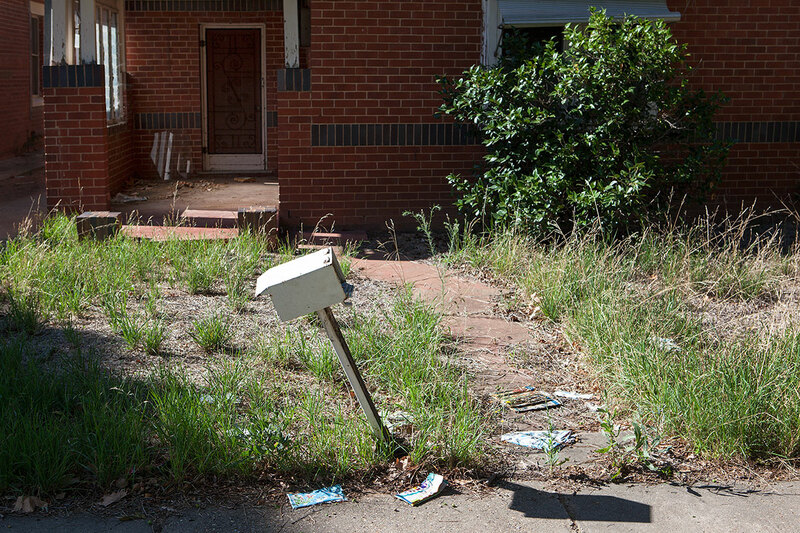 Johnston Street – The offers keep rolling in, an indiscriminate symptom of abandonment. 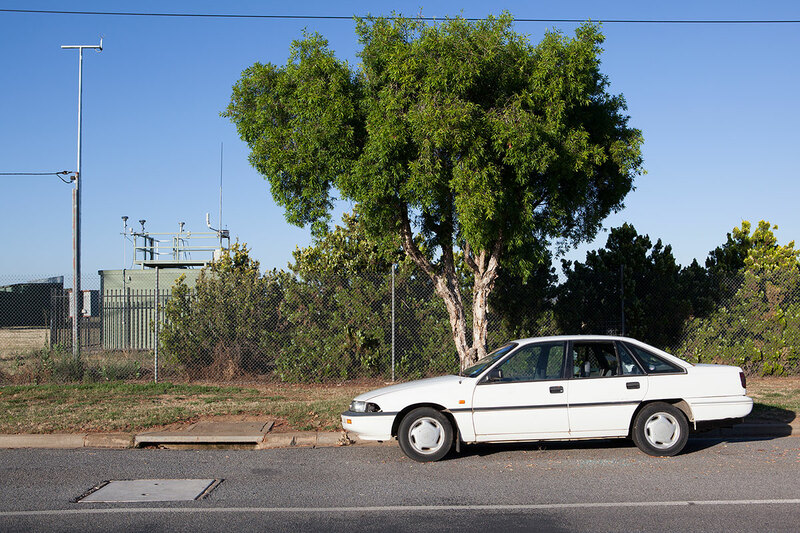 Emily – This extroverted display of sadness and loss is an increasingly familiar contemporary lament. 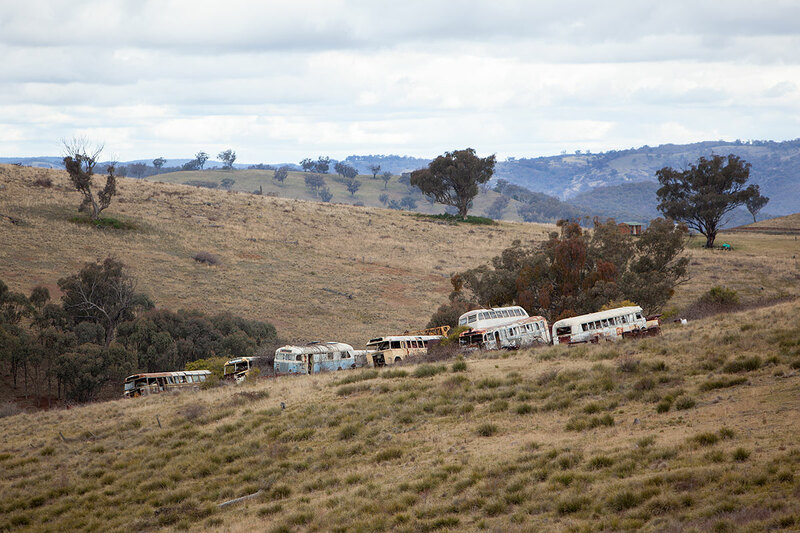 Recreation Reserve – A small town’s last-ditch effort to stop the exodus. 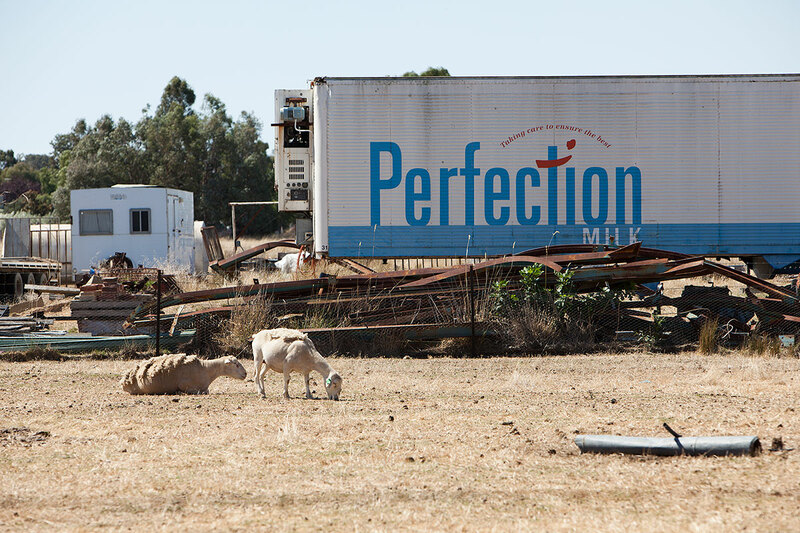 Milawa Perfection – Promised dreams bite the dust as contentment looms. 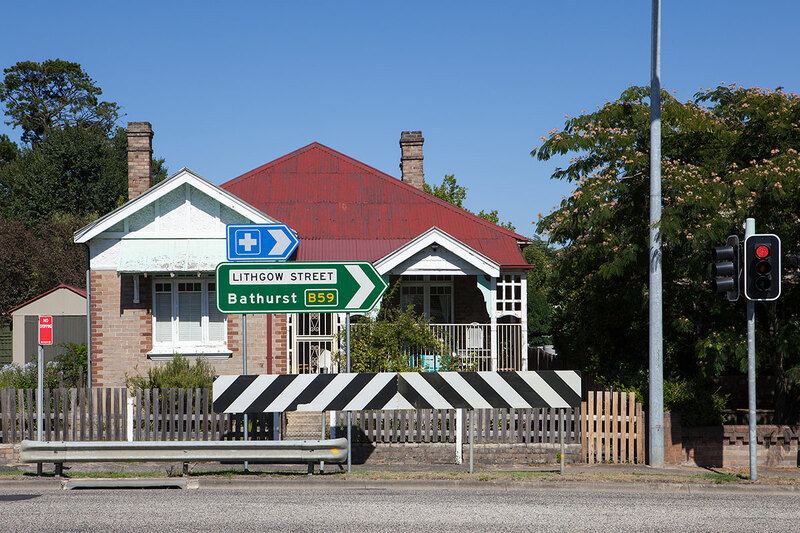 Lithgow Intersection – The road ahead doesn’t always lead to the blissful serenity of home. 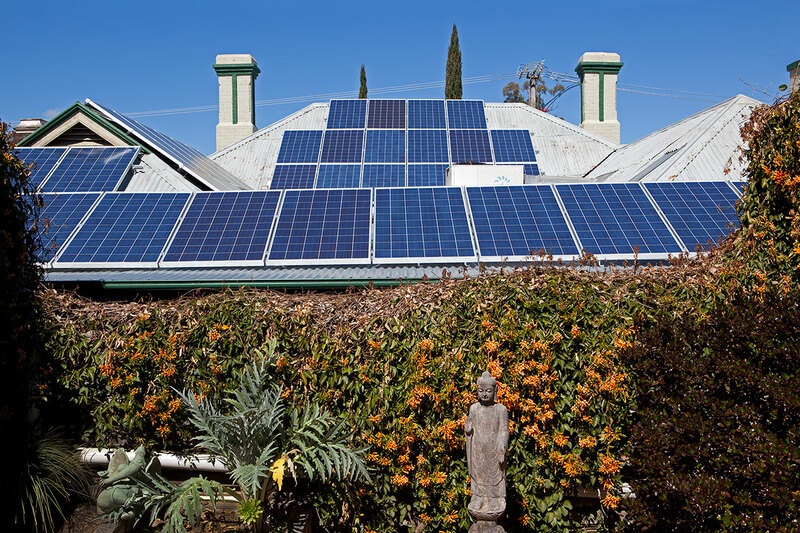 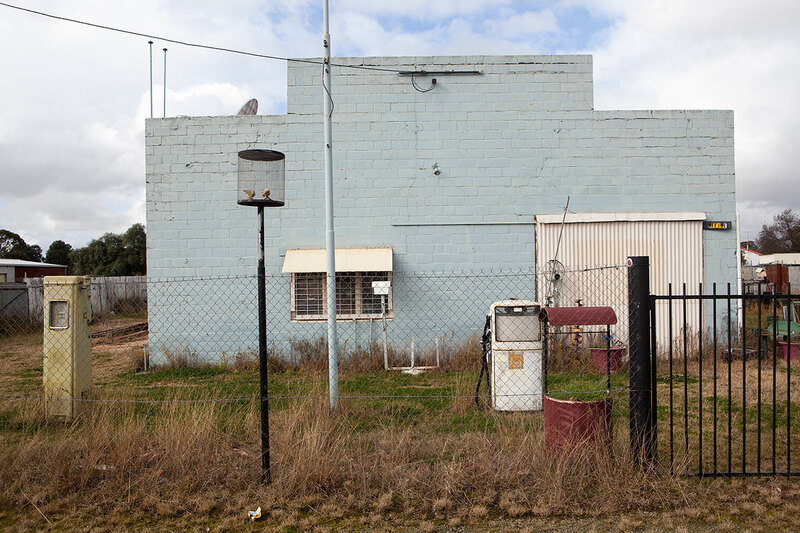 Last Stop Sofala – The final journey: a trip to the picturesque countryside. 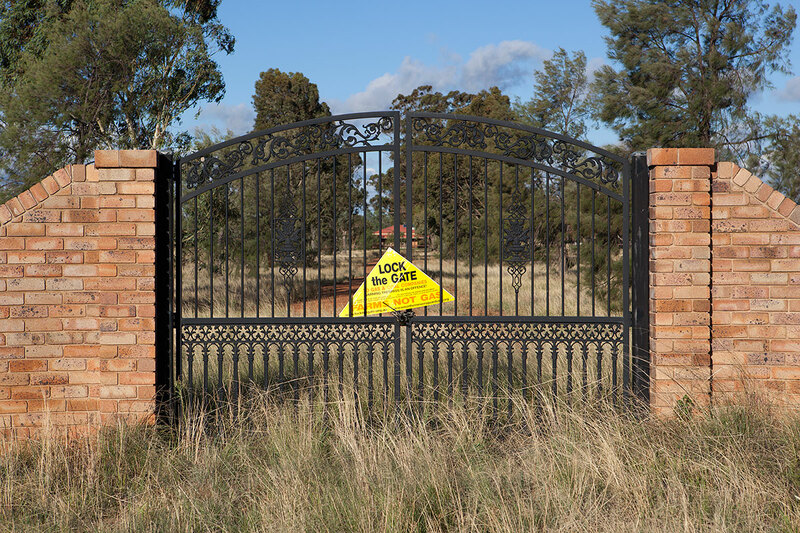 Lock the Gate Campaign – Like cutting off a nose to spite its face, we sadly lose the freedom of access to what we strive to protect. 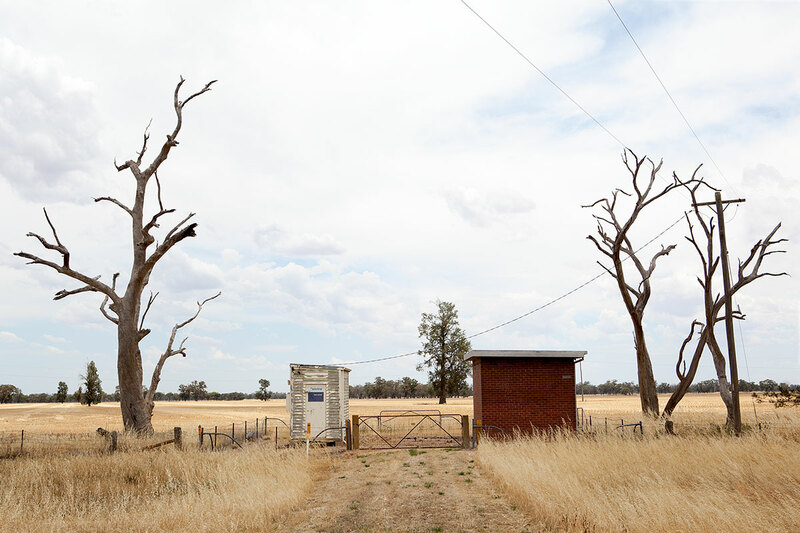 Cootamundra Gate – A chained façade endures, a reminder of the fallacy of security. 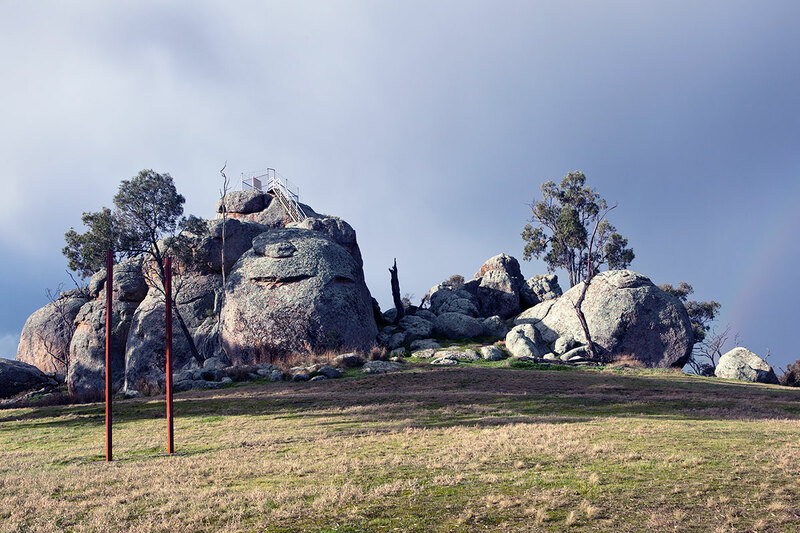 Mount Remarkable – The extent of our indelibly stamped human imprint is equally remarkable. 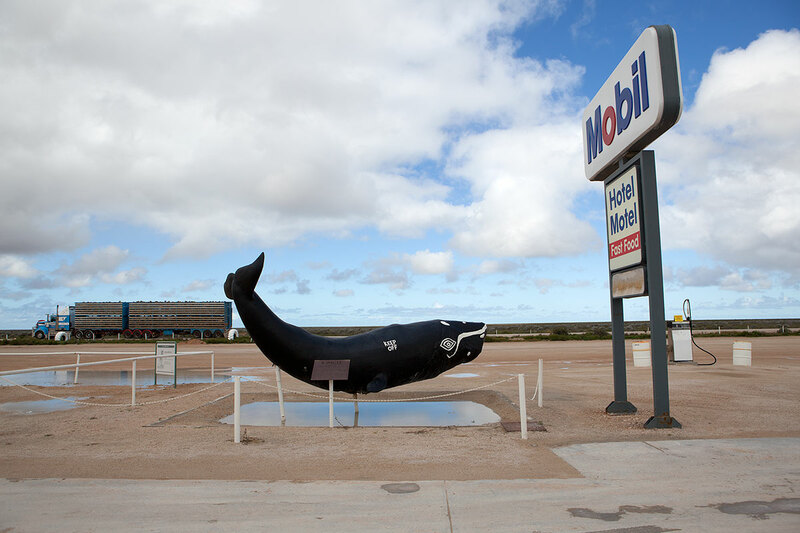 Nullarbor Whale – Held aloft above a meager inland sea, the whale, conquered, replicated, and owned, can only watch as we mindlessly rush past. 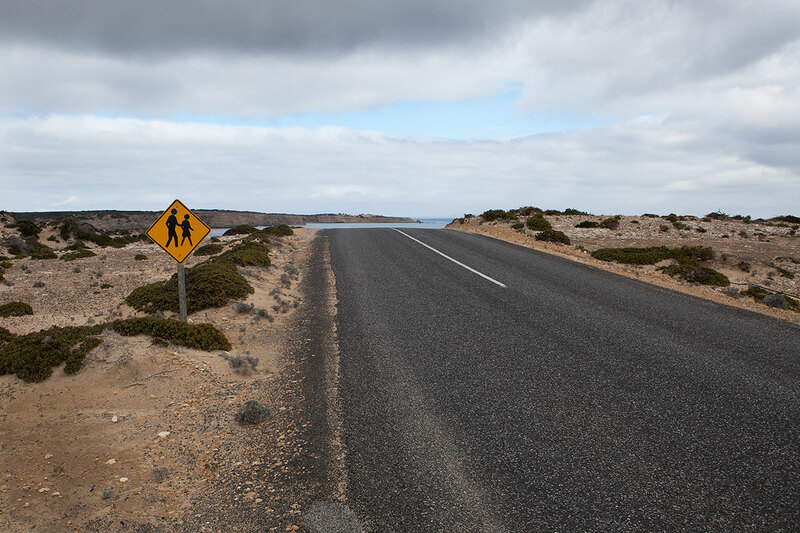 Coffin Bay – This highway of denial of our ancient rhythms, which carves its way through nature’s own warnings, careers relentlessly towards the inevitable edge. 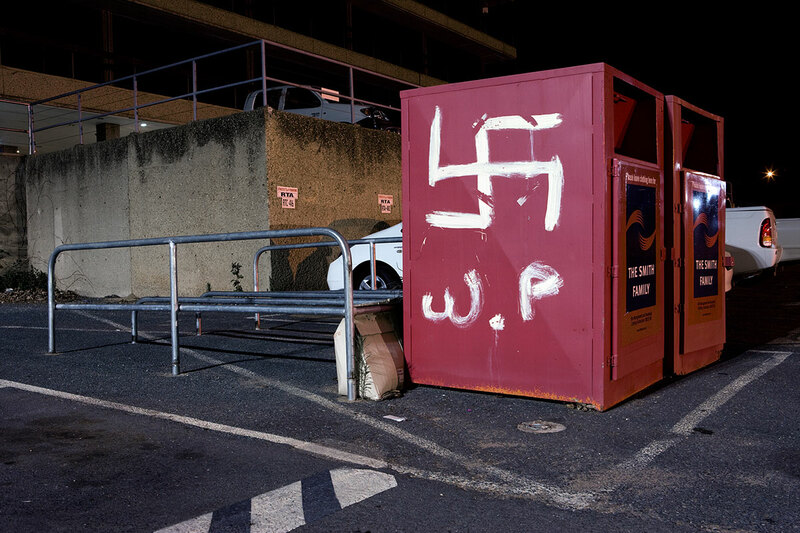 Nazis in the Night – Some donations are less charitable in their sentiment. 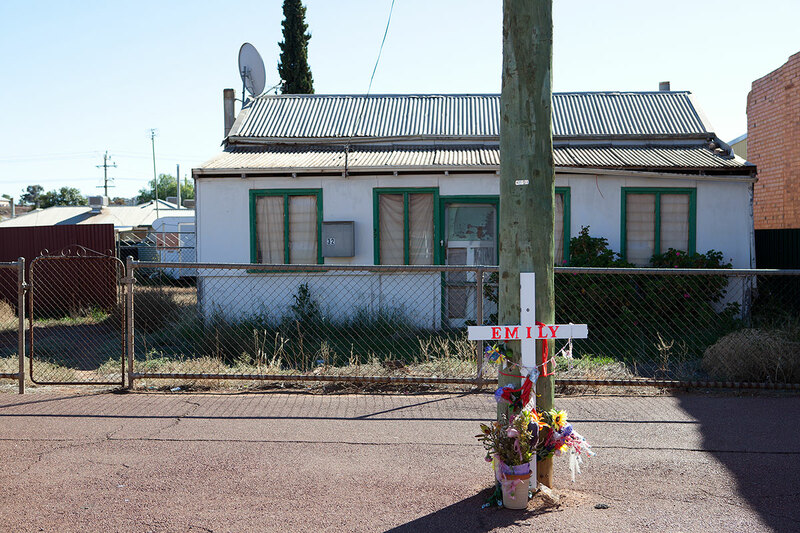 Port Augusta Cloud – Near what is known as the ‘Crossroads of Australia’, this neutral intersection of expression is background to a lone roadside memorial. 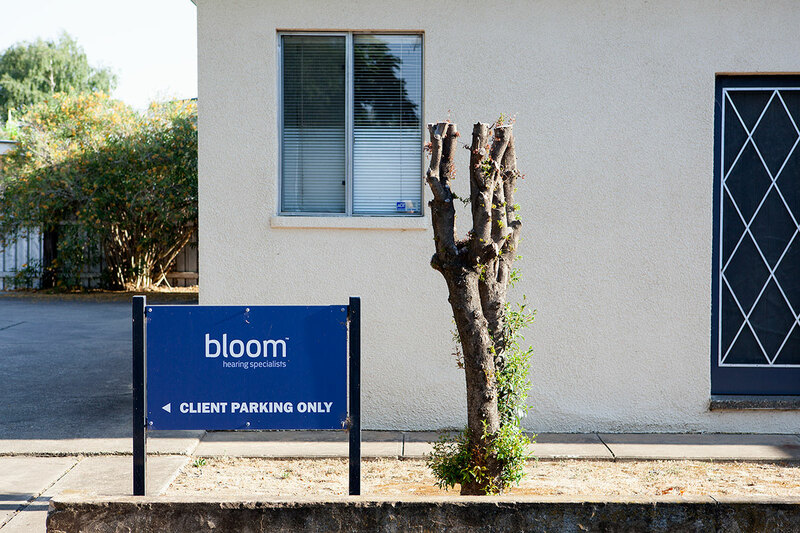 Pruned Blooms – One sense enhanced, another diminished. 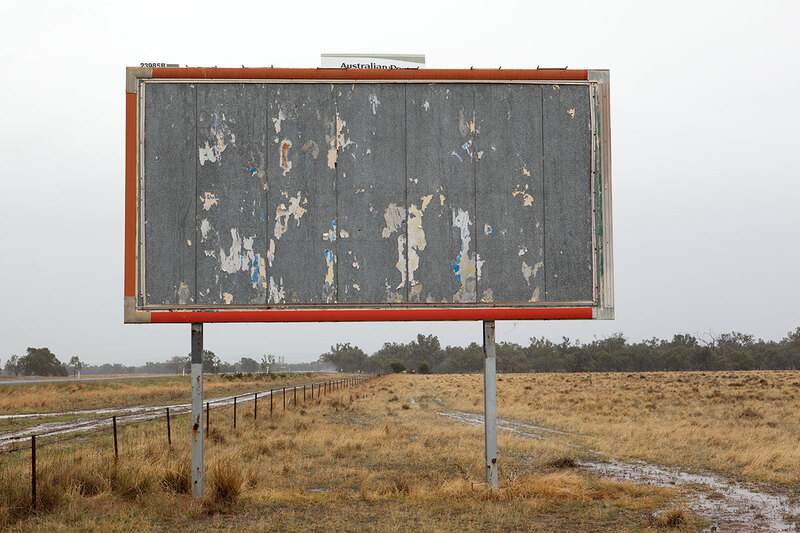 A sign of Our Times – Want it, own it, buy it. 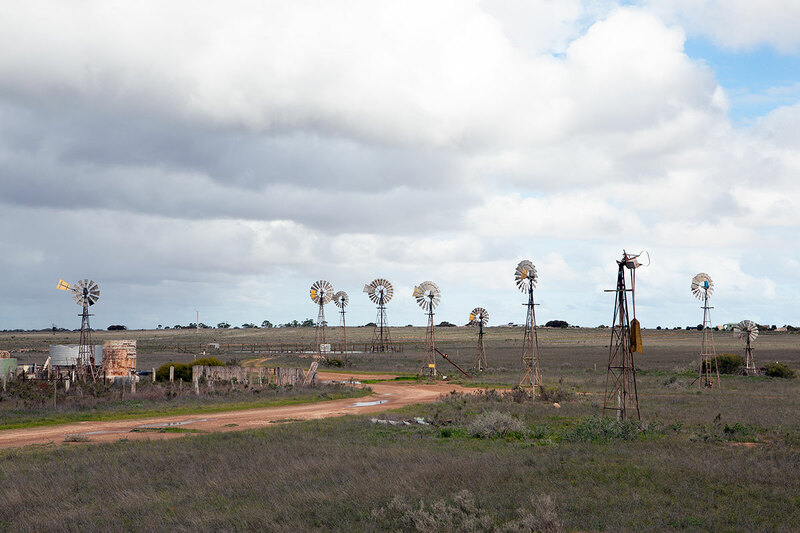 Penong Windmills – A sad reminder is all that remains of the delicate relationship between nature and resource, and a recent fall of rain does little more than mock our efforts. 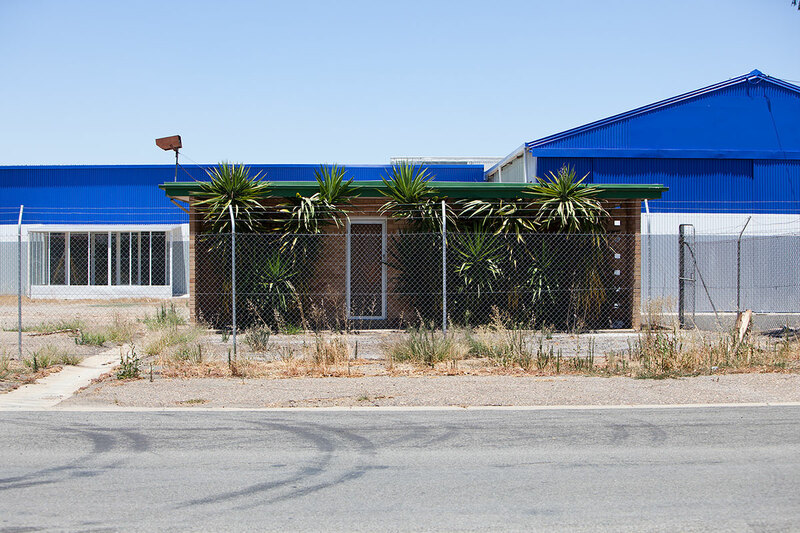 Dubbo Drive In – Planted to impede non-paying patrons without cars, the now rampant cacti perform better than ever. 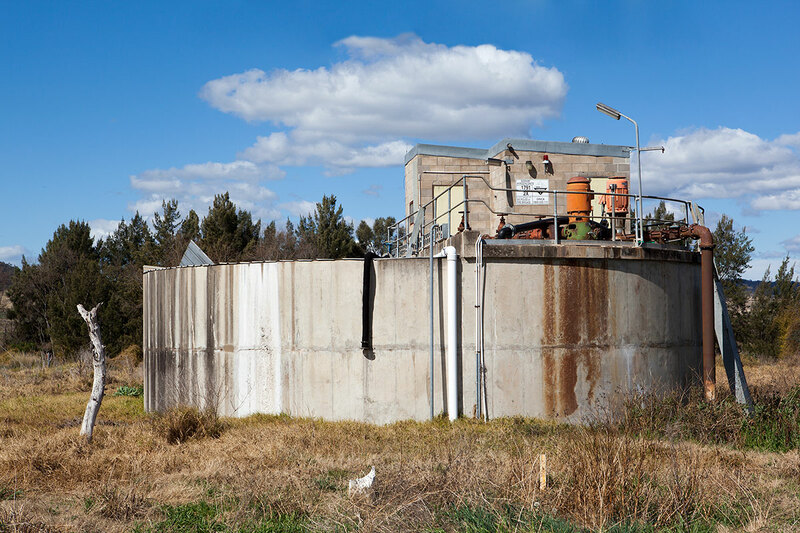 Civil Management – This tank lies on the edge of town, just off the somewhat incongruously named Golden Highway. 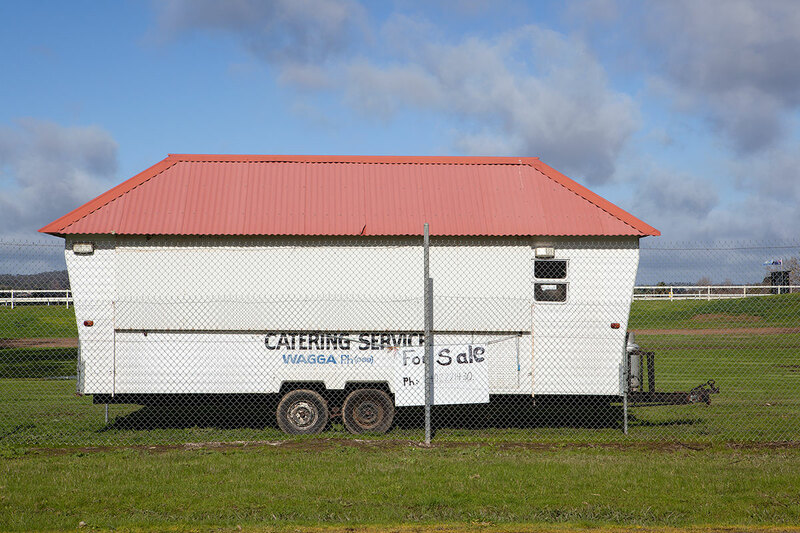 Murrumbidgee Catering Van – Like a shop window, this fence separates what someone has from what someone wants. 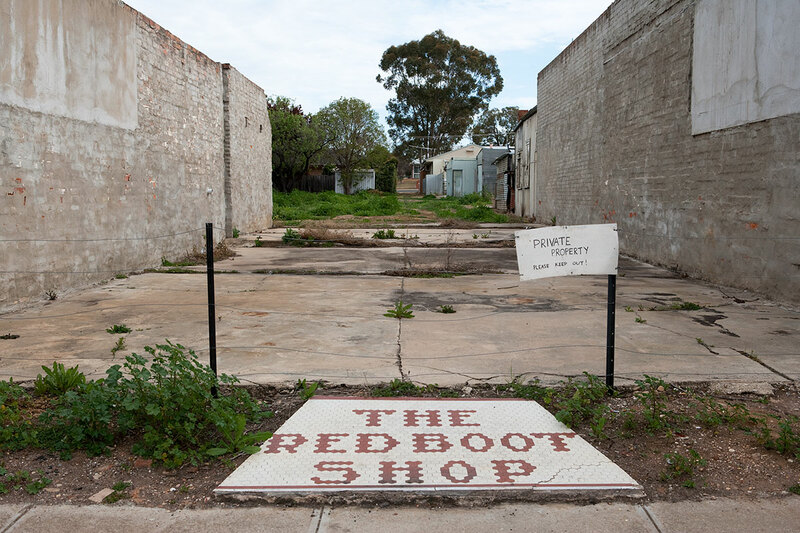 The Red Boot Shop – Even with nothing left to protect, these boots weren’t made for walking through this well-worn local shortcut. 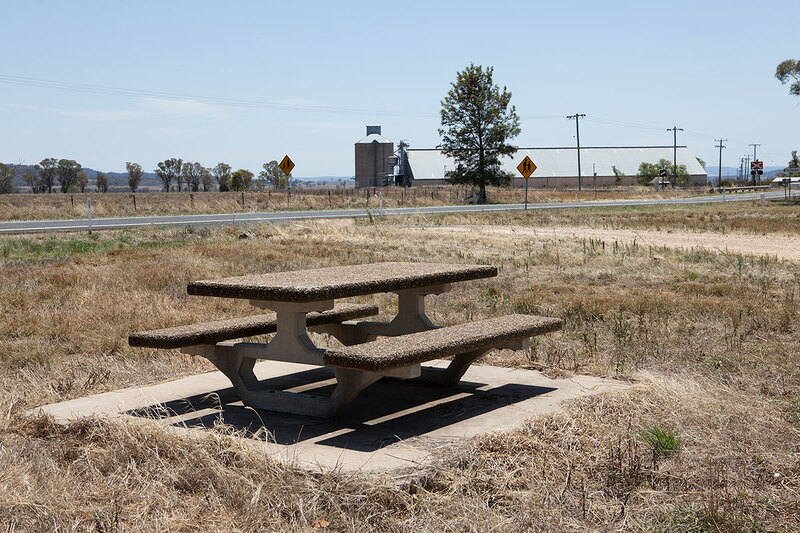 Comfort Stop – Like life, it seems as if this roadside rest stop is no picnic. 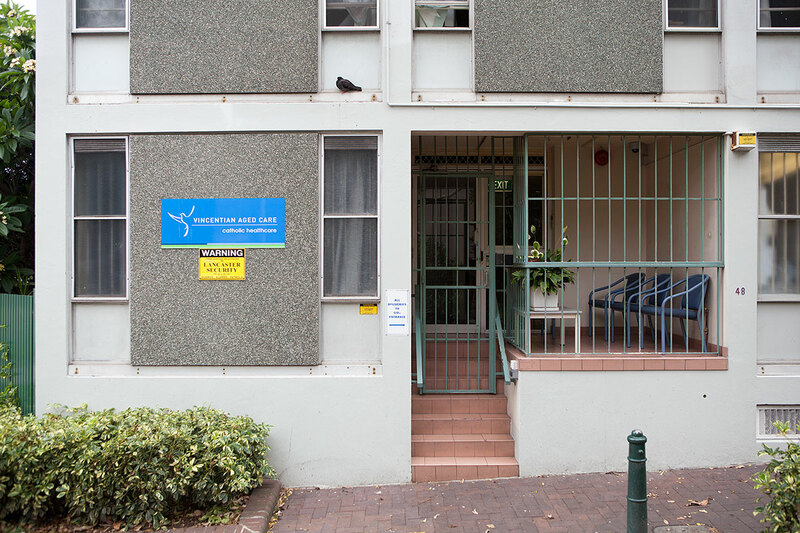 Caged Care – On some days an elderly resident casts crumbs to the birds outside the bars. 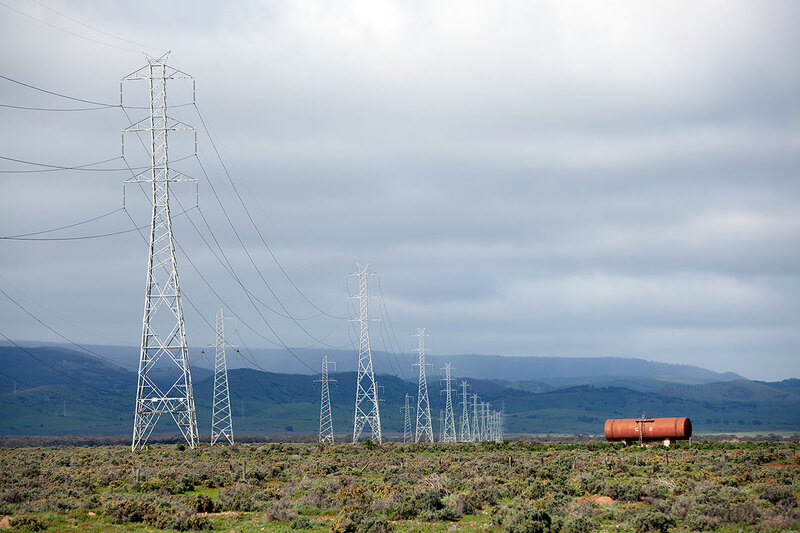 © 2015 Jamie Holcombe All Rights Reserved.